A pet’s demise is surely the least that any pet-lover would ever want. If you have a pet, who has grown to be part of your family through the years, saying goodbye is never an easy thing. This even becomes harder in the case of pet euthanasia. Deciding to finally put your pet to sleep is a decision that you can never make in haste. It can be emotionally-draining, especially if you think of how sad life would be in the absence of your source of joy – your pet. Nonetheless, in most cases, you have to do what is right, and that is to finally let go. Death may sound harsh, but it is better than seeing your pet suffer.In order to lessen the suffering brought by pet euthanasia, make sure to be prepared for the day you have to say goodbye. This is perhaps the most important thing, and this is where you will start to feel the pain. Once your vet recommends euthanasia, if you are unsure, you can consider seeking a second opinion for you to have peace of mind. Also, be vigilant enough to watch for obvious signs that the quality of life of your pet is already declining, which can be indicative of the need to have euthanasia. Once you have decided to finally let go, spend time in choosing the best veterinary clinic to execute the procedure. Like humans, pets deserve a peaceful and decent death. The pain is going to be worse if you know the pet will die in such a cruel manner. Before you finally give the green light for pet euthanasia, find a quiet spot where you can have meditation. Never make a decision when you are in fear, anger, or any other negative or heavy emotions. It would be best to stay calm and have a positive state of mind. Think of the happy moments with your pet. Evaluate the necessity of euthanasia and think About how it can be better for your pet. Although it is hard to accept, the hard-hitting reality of life is that death is inevitable, and it can come sooner for the better. As a way of preparing for pet euthanasia, you should talk to the vet and ask how the procedure is going to be performed. This is commonly done through an injection of anesthetic overdose. If you think that the procedure is too cruel, you can ask the vet for other options. Asking how it is done is important because it will allow you to make the right decision and make sure that death will be more acceptable as it is bearable for your beloved pet. Just like humans, pets should be laid into rest in the most decent way that is possible. As part of your preparation, think in advance about how aftercare will be handled, such as burial and cremation. Some may resort into private cremation and resort into keeping the ashes of their pet. Through this, they can always be together. There are some who choose to have them buried in a pet cemetery. Some pet owners choose to be not there when the procedure happens because pain is just too much for them to bear. Nonetheless, being absent is not a good thing as it indicates lack of support. On the day your pet is to be euthanized, make sure to be present. Ask family and friends to be there as well. It may be one of the saddest days of your life, but when you are around people who matter, it becomes easier to accept the reality that your pet has to go. Before being euthanized, make sure that you say a little prayer for your pet. For some, this can be done in the form of a poem or any sort of last message. This can be a chance for you to relive your memories and say sorry for what you have to do for the better. You can ask family and friends to have their farewell message as well just like what happens in a traditional funeral. 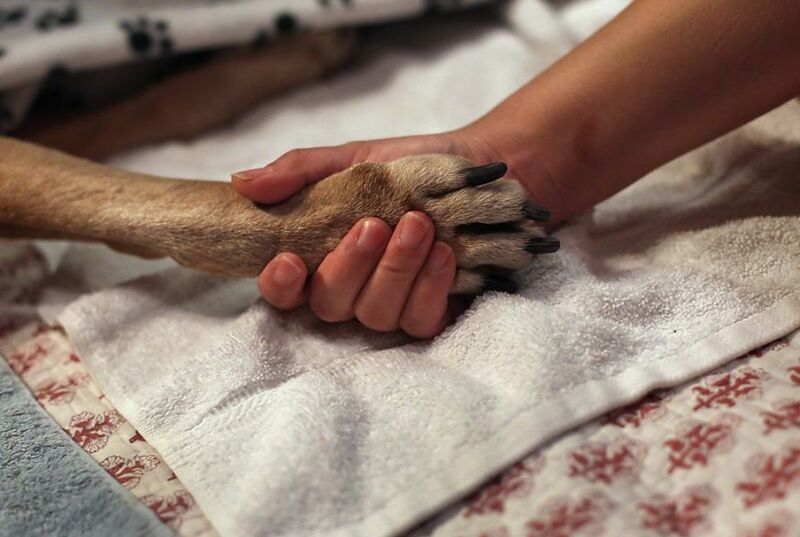 Hold your pet for the last time and accept the procedure with an open heart. Pray for the courage to accept the decision that you made and for the hope that in the future, you can find and give the same amount of love to another pet.